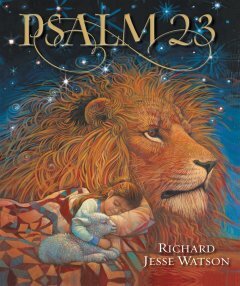 The Psalm of David is retold in this beautiful children’s board book by Richard Watson. Page by page children will be fascinated by the promise in the words of this great verse of Psalms. Young minds will be inspired to memorize the verse as the words come to life in the colorful and very detailed illustrations. The entire verse (Psalm 23) is printed on the last page. With illustrations that bring to life Psalm 23, the popular picture book is now available in board book format. As a follow-up to his bestselling children’s book, The Lord’s Prayer, Richard Jesse Watson created Psalm 23. The soothing and familiar words of the iconic scripture are paired with the vibrant and child-friendly illustrations of Richard Jesse Watson, resulting in a board book edition of the acclaimed picture book that is pleasing to the eyes and soul. Using KJV text, this book helps familiarize children with real biblical text while also incorporating beautiful illustrations that help make the words of David come alive for even the youngest reader.